The internet is increasingly a place where Americans just hang out. Surfing the Web has become one of the most popular activities that internet users will do online on a typical day. Some 30% of internet users go online on any given day for no particular reason, just for fun or to pass the time. This makes the act of hanging out online one of the most popular activities tracked by the Pew Internet & American Life Project and indicates that the online environment is increasingly popular as a place for people to spend their free time. 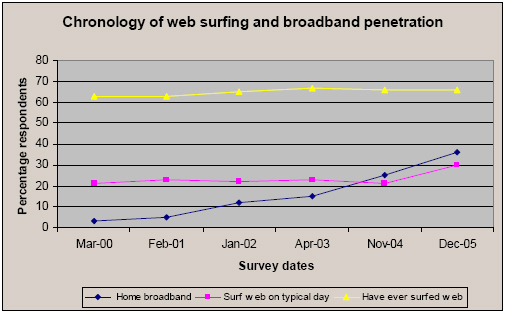 Compared to other online pursuits, the act of surfing for fun now stands only behind sending or receiving email (52% of internet users do this on a typical day) and using a search engine (38% of internet users do this on a typical day), and is in a virtual tie for third with the act of getting news online (31% of internet users do this on a typical day). In aggregate figures, this development is striking because it represents a significant increase from the number of people who went online just to browse for fun on a typical day at the end of 2004. In a survey in late November 2004, about 25 million people went online on any given day just to browse for fun. In the Pew Internet Project survey in December, 2005, that number had risen to about 40 million people. The Project’s December survey asked about Web surfing in two ways. We asked all internet users: “Do you ever go online for no particular reason, just for fun or to pass the time?” Two-thirds of internet users, 66%, answered “yes” to this question, a percentage that has held about steady since we began asking the question in 2000. We also asked internet users if they went online “yesterday,” referring to the day before the respondent was interviewed. Respondents who said “yes” were then asked, “Did you go online for no particular reason, just for fun or to pass the time yesterday?” In this case, 30% answered “yes.” We interpret the positive responses to indicate that 30% of internet users were surfing the Web for fun on an average day in December 2005. This figure shows striking growth compared to previous surveys when we asked the same questions. Gender: Although men and women are equally likely to have tried Web surfing for fun, online men are significantly more likely than women to do this on an average day. Men have always led women to a small degree in their likelihood of going online on an average day with no particular purpose. While percentages of both men and women increased to record highs in December 2005, the increase from a year before was ever higher for men, from 24% to 34%, than for women, from 19% to 26%. 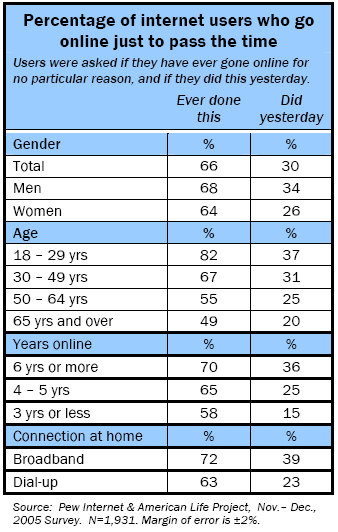 Age: Web surfing is more attractive to younger users. The younger the user, the more likely he or she is to surf for fun, either at all or on a typical day. Internet experience: Surfing the Web for fun is something that two-thirds of internet users try, and the majority of users try it from even their earliest days online. But the more years of internet experience, the more likely users are to browse for fun on a typical day. Some 36% of internet users with six or more years of experience will surf for no particular reason on an average day, compared to fewer than a quarter of those with less experience online. Home broadband access: Those who have broadband access at home are significantly more likely than those with dial-up to have surfed the Web for fun, and dramatically more so on a given day. Some 72% of those with home broadband have surfed the Web this way, compared with 63% of those with dial-up; and almost twice the number, 39%, do so on a typical day, compared with 23% of dial-up users. Why the increase now; the beginning of a trend? This new appeal of idle Web surfing on a typical day takes places in the context of at least two relevant ongoing changes in the internet world: increasing numbers of people who have broadband access in their homes and a growing body of content and applications on the Web. Broadband connections certainly make Web surfing easier, faster, and more pleasant an experience. More Web content and more applications means a greater variety of experiences for people with different interests to enjoy. Both home broadband penetration rates and amount of Web content are likely to continue to grow. Perhaps the rise in either broadband or Web content has crossed a kind of threshold that stimulated a rise in everyday Web surfing. Perhaps, as these two factors likely continue to rise, this moment marks the beginning of a trend of increasing everyday Web surfing. Or perhaps the rise in Web surfing on a given day marks an uptick that has hit an upper limit. Penetration rates for home broadband access have risen from about 3% in 2000 to 36% at the end of 2005. The rise of Web surfing for no particular purpose on a typical day has remained steady at about 20% until the last year, when it took a sudden upswing, and only then did it match the rise of home broadband access from one-quarter to more one-third of American households. 72% of those who have broadband access at home have surfed the Web for fun; 39% of those with broadband at home do it on a typical day. 63% of dial-up users have surfed the Web for fun; 23% of dial-up users do it on a typical day. Users have already folded purposeful Web activities into their everyday lives — communicating, gathering information or looking for answers. Now, they have added Web surfing — going online without any particular purpose to that list. Many people have described the internet in terms of different purposeful places: a library, or a shopping mall, or a post office. Now we can add “destination resort” – a place to go just to have fun or pass the time — to that list. The Pew Internet & American Life Project is a non-profit, non-partisan research organization that is funded by the Pew Charitable Trusts to examine the social impact of the internet.